The D-Link DSA-3100 Public/Private Hot Spot Gateway is an Ethernet-based gateway specifically designed to provide free or fee-based broadband connection to the public or to a company's employees while at the same time, providing a separate and secure private network that shares the same Internet connection. D-Link, the industry leader in innovative networking solutions, introduces the Airspot family of hot spot gateway products. With the increasing number of telecommuters and road warriors, Wi-Fi enabled hot spots have spread across the country to accommodate the need for on-demand Internet access. The D-Link Airspot DSA-3100 Public/Private Hot Spot Gateway provides business owners a simple solution for adding public Internet service to their establishment while still maintaining the integrity of their existing network. The DSA-3100 Public/Private Hot Spot Gateway is a secure gateway designed to create two distinct networks through its integrated public and private ports. By adding a wireless access point to the public port on the DSA-3100, customers and patrons can connect to a free or fee-based broadband Internet connection. Through the private port, hot spot operators can be assured their private and confidential information is secured from public access. And depending on the establishment size and network deployment needs, hot spot operators can add switches and access points to expand their networks to provide full wireless coverage. Business owners maintain full control over their hot spot service using the DSA-3100’s wide variety of advanced features. This gateway manages up to 250 user accounts in its internal database and supports at least 50 users online at any time. Additional features include user bandwidth control, network policy enforcement, customizable user timer, login/logout web-page, online traffic monitoring, and URL redirection. 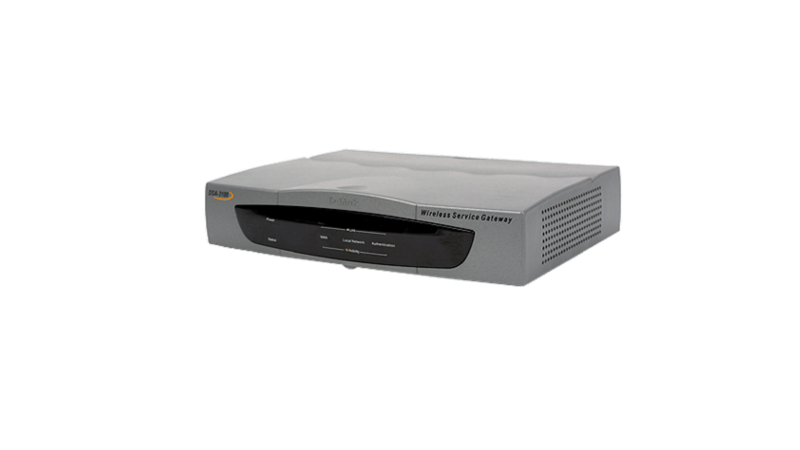 The DSA-3100 also supports NAT IP Plug & Play (PnP) which allows any networkable computer to connect to the Internet without having to change their static IP configurations. In order to prevent unauthorized users from accessing your public hot spot services, the DSA-3100 Public/Private Hot Spot Gateway supports Authentication, Authorization, and Accounting (AAA) to ensure all connecting wireless users have been granted access. The DSA-3100 also supports POP3, RADIUS, and LDAP external authentication for larger-scale hot spot networks. For the private network, the integrated DHCP server and firewall with Denial of Service (DoS) Protection safeguards the network from malicious attacks and hackers. Hot spot operators can easily manage the DSA-3100 unit and all its provided features via its Web-based configuration utility. The user-friendly interface is intuitive enough for anyone managing the hot spot establishment to use and reconfigure settings if necessary. Whether the location is a coffee shop, airport terminal, bookstore, or resort, business owners can maximize their network investment using DSA-3100 Public/Private Hot Spot Gateway to provide their customers with the value-added service of a public hot spot network.